Get the Ecofish advantage, our expert advice will result in better solutions for your project and the environment. Spawning and rearing habitat for Rainbow Trout (Oncorhynchus mykiss) was created to offset predicted habitat losses resulting from hydroelectric development in Whistler, BC. The project generated additional benefits for Kokanee Salmon (Oncorhynchus nerka), Bull Trout (Salvelinus confluentus), and other fish species, to offset predicted habitat losses resulting from hydroelectric development. Client: Innergex Renewable Energy Inc.
Innergex Renewable Energy Inc. engaged Ecofish to provide habitat enhancement to offset the predicted habitat losses from the Fitzsimmons Creek Hydroelectric Project in Whistler, BC. Ecofish developed an options matrix which identified all suitable projects for the target species. We engaged the Resort Municipality and the Whistler Fisheries Stewardship Group to refine the list and Crabapple Creek was chosen as the viable option to provide habitat enhancement to offset the predicted habitat losses from the Fitzsimmons Creek Hydroelectric Project in Whistler, BC. Crabapple Creek is a small stream located in Whistler, BC that flows through residential neighbourhoods and the Whistler Creek Golf Course, where it had been subjected to effects of urbanization (e.g. channelization, lack of diverse habitats). We installed 12 rock riffles and associated spawning gravel, placed ten large woody debris structures, and planted a riparian area. Our work created 288 m2 of spawning and 709 m2 of rearing habitat for Rainbow Trout, Bull Trout, and Kokanee Salmon. The total length of channel restored was 1,100 m.
We were responsible for determining project effects, outlining potential compensation options, working with stakeholders to prioritize options, permitting, managing contractors for construction, environmental monitoring, revegetation planning, effectiveness monitoring and developing interpretive signage for the high profile locations. 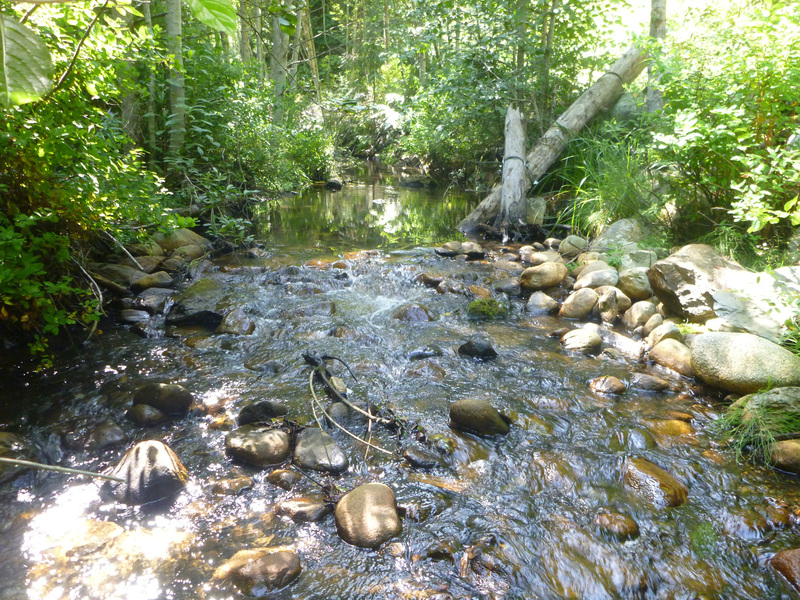 Monitoring has shown that the habitat is functioning as intended with Rainbow Trout adults observed using the gravel platforms for spawning and the fry using the large woody debris for rearing platforms. “The quality of Ecofish’s work is fantastic. I can always trust Ecofish to get a job done and to a very high quality without much oversight on my part. Being the coordinator of various other projects that require my time and attention, there is something to be said about being able to trust your consultant and know they will get the work done well, on time and on budget. It brings a level of comfort.